On-demand startups, which are a subset of the Collaborative Economy, have been under scrutiny on worker treatment. They’re under the magnifying glass more than ever. This new industry, which was birthed the 2008 recession, provided rise to the “gig” worker, or independent contractors. These part-time workers were offering their idle time, working multiple jobs, and offering their spare bedrooms to make ends meet. Many of the workers see the benefits of “being their own boss” as they can choose the time, service, and how they work –rather than reporting to a salaried job. In past months, there’s been increasing pressure to shift the relationship from contractors to employees. There have been lawsuits against Uber, where a single driver was able to win business expenses, but also we’re seeing American presidential candidates like Hillary Clinton suggest she’ll be influencing startups to provide fair wages and benefits to workers, while Jeb Bush takes Uber rides in San Francisco, promoting the service and free market capitalism. Providing worker resources for freelancers isn’t new. For more than a decade, the Freelancers Union, featured here in The NYT, offers centralized healthcare, retirement programs, and other job-related services. Peers, a three-year-old sharing economy advocacy group, is also making signals that they plan to offer resources to these gig workers. This blog is used to track the trends in this new economy and explain what it means to established businesses. As such, we will track how these contractor relationships are now starting to shift toward full-time and part-time employee relationships. Here’s a running list, mostly in chronological order. 2014: Zirtual’s shared virtual assistants are employees (W-2 workers). I’ve used this service for more than two years and have worked with a variety of Zirtual assistants. They have dedicated work hours to respond to their clients, and have tools at their disposal. For as long as I’ve known, they’ve been W-2 workers. This group was savvy to figure this out. 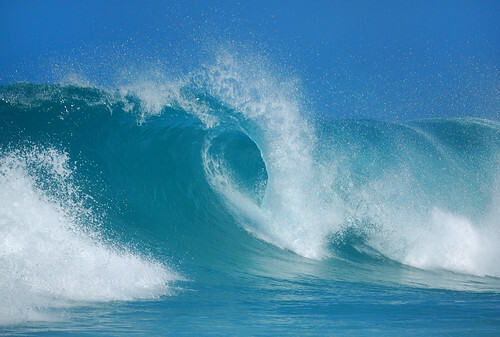 Edit: Zirtual had a shocking shift a week after this post published, my thoughts here. Jun 17, 2015: A single Uber driver was able to win a lawsuit, awarding her thousands in business expenses. Some anticipate this will lead to a class action lawsuit, but Uber indicates this is non-binding. A simple search on Google yields lawyers are chomping at the bit for a class action lawsuit against this heavily funded company. All drivers are 1099 “partners,” to my knowledge. June 22, 2015: After the news broke at Uber, Instacart converted some of its workers, those who assemble the groceries for customers and couriers, to employees. Jul 1, 2015: Shyp has converted their contractors into full-time workers, citing this would lead to longer-term relationships with the staff. Jul 17, 2015: Homejoy has shuttered due to, in part, misclassification of workers. In my interactions with employees at Homejoy, each home cleaning was operating at a loss, compounding the issues, and scaring off would-be investors. Jul 25, 2015: Yesterday, Luxe Valet announced its workers are now W-2 employees. This service offers a valet who meets me in an urban area and parks my car for $15 a day –regular parking in San Francisco is $25, and I can specify where to pick up and drop off my car, saving me time. Read about my experience. Yesterday, we had food delivered from Munchery, a startup that brings healthy, unique meals to my doorstep. I asked the courier about her employment status, and she was a part-time W-2 employee. They’re known for doing their best to care for employees. Aug 3, 2015: Eden, which offers on-demand workers, has converted their workforce from 1099 to W2. Thank you April Rinne for surfacing this. Update Aug 3: Some Instacart workers are not happy about the shift to W2 employment, lost hours, less pay, little voice. Thank you Natalie Foster for the link. Sept 1, 2015: KitchenSurfing shifts independent contractors to employees. Thank you April Rinne for bringing this to my attention. If I missed any examples, please let me know, and I’ll update the post, crediting you. This means: Short-term suffering for startups, but long term resilience for the Collaborative Economy.Tech startups, under scrutiny from workers rights advocates and the political election, are shifting workers into employee relationships rather than independent contractor status. This does not mean the space will collapse, as nearly every other established industry from retail, to hospitality, to food, has successfully operated with workers that are employees. It does mean that these companies will need to provide ample training, resources, and also hold employees accountable based on customer feedback and ratings –just as other established companies do. It also means that these startups will need to provide new forms of worker benefits, discounts, and perks under these new relationships. We already see that these startups, and their workers, are lobbying for a third class of workers dubbed “Dependent Contractors” which could work several services at once while benefiting from 401k, retirement, healthcare benefits, and fair treatment of workers. Want to learn more? You can check out my full body of work on the Collaborative Economy, which includes reports, graphs, databases, lists, frameworks, info graphics, essays, and points of view. 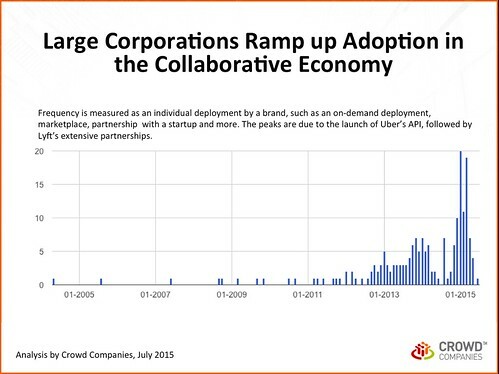 The Collaborative Economy market is growing at an accelerated rate. Not only is adoption increasing by individuals at a rapid pace, but the VCs have invested a massive $16 Billion to pad the war chests of these disruptive P2P commerce startups. Corporations aren’t standing on the sidelines waiting to be disrupted, the progressive companies are leading the charge by deploying these same strategies and technologies. The following three slides show market growth, adoption by brands, and indicate how companies are deploying, you can view all the data in a Google Sheet, live on the web and thanks to Amy Bishop for her research analysis managing the sheet. Above: These five stats indicate the growth of the disruptive startups: Young companies, rapid growth, high volume, low assets, and high valuation show how business models based on networked based technology quickly achieve scalable growth. Often, traditional companies are based on the principals of the Industrial Revolution, owning many assets and achieving linear growth. Above: Large corporations, which we define as companies with over 1000 employees, $1B in revenue, and are often Fortune 1000 companies are also adopting, many in the last two years. Towards the end of 2014 we saw a significant increase in adoption in part from Uber’s API which led several partnerships, and Lyft’s aggressive partnerships in early 2015. Coincidentally, Crowd Companies is just over a year-and-half-old, launched right before the large companies started to deploy in scale. 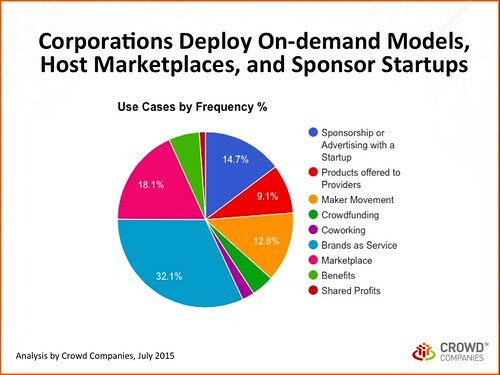 Above: You’re probably wondering what corporations are doing, in order of frequency, they’re deploying what we call as “Brand as a Service” which include on-demand models, such as Whole Foods partnering with Instacart, rental models like BMW’s DriveNow program. Corporations are also launching their own marketplaces, such as Cisco’s used networking marketplace, Patagonia’s used apparel store, and Ikea’s marketplace of used goods. Lastly, companies are sponsoring the startups with advertising, or co-marketing such as Lyft and MasterCard for “Priceless Rides”, or KLM partnering with Airbnb to offer a unique airline apartments for rent. 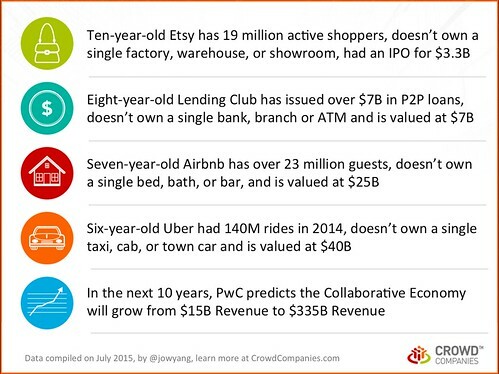 Companies are quickly jumping into the Collaborative Economy, but frequency doesn’t indicate success. While there’s been over 190 case examples, I only know of the business results of a few, and to my knowledge only one company (BMW) has indicated that a program was profitable, in public. One thing is for sure, this is the market for the brave early adopters who want to lead the charge, not wait for the movement to pass them by, and in many cases these corporations embrace innovation, and therefore the risk of not seeing direct results for a few quarters or years. Also, when we launched Crowd Companies there was approximately 70 case examples, and since then, there’s been about 120 more deployed in a year and a half, many by our own members, the pickup is certainly increasing. The adoption will only continue to increase in frequency, to the point where we can no longer accurately track deployments as every corporation will have dozens of iniatives.